Vagner Rocha On "No Nutella BJJ" Movement: Have You Ever Fought Someone Really Trying To Kill You? Vagner Rocha On “No Nutella BJJ” Movement: Have You Ever Fought Someone Really Trying To Kill You? 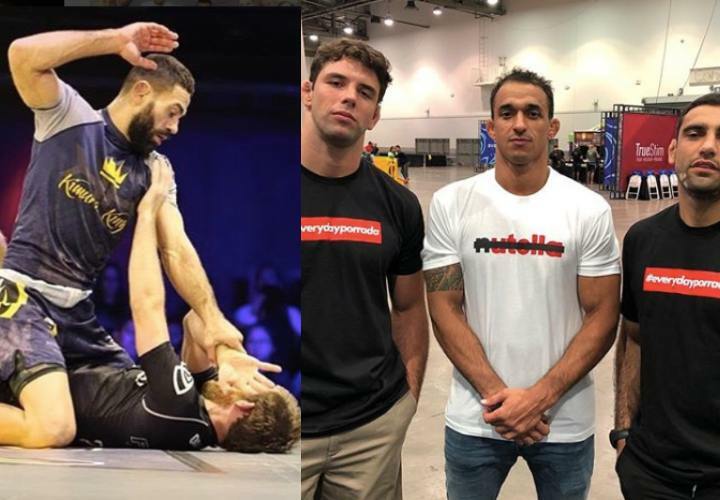 Aug 29, 2018BJJEEArticles, BJJ NewsComments Off on Vagner Rocha On “No Nutella BJJ” Movement: Have You Ever Fought Someone Really Trying To Kill You? Nowadays it’s common to hear the buzzwords “no nutella” or “Porrada” used by Jiu-JItsu practitioners. It’s been used in Brazil for years, but has only recently gained popularity with the English-speaking jiu-jitsu practitioners. #everydayporrada means to go hard and intense not only in BJJ but in all aspects of life. On ADCC Day 2. On the backstage mat, while stretching, I noticed Renzo Gracie making eye contact with me (Remembering he was also there to warm up for his match, all the competitors had already left to compete, there was only a few competitors left in that area). The ones that know me well, are very aware that I don’t go easy warming up before my matches. So, I looked over to my brother @enricococcobjj and we are now doing a “warm-up roll”. About 5 minutes in our roll, Renzo yells out to me: “WHAT THE HELL IS THAT”? I replied: “I am warming up!” so he asked me why was I going so hard? I, then explained that I needed that intensity to get in the mindset of fighting. “What’s Nutella Jiu-Jitsu? “Nutella is fake chocolate! I like real chocolate! I like real Jiu-jitsu! The roots Jiu-Jitsu!” Renzo is a trip and my story of my warm-up session was told by him to the rest of the ADCC crew, but it got funnier every time he told the story. A true legend with the best personality, charismatic, humble, and a true samurai. “Hey guys here’s a breakdown of JiuJitsu. When I was a child doing jiu-jitsu almost 20 years ago a black belt in jiu-jitsu was untouchable to a regular civilian in all aspects of self defense. In a roll, in a fight, in an MMA fight, in gi or no gi, any black belt young or old, small or big was a killer. Today we use the phrase “ The Gentle Art” and it misleads us when we train. I think this mind set is watering down the art and actually making it “The Gentle “Soft” Art”. That’s because our art has become softened by the rules we set for competition. It is also the reason we see fewer and fewer true jiu-jitsu Artist in MMA. Let’s break it down guys, when you train knowing “I can’t do this in a regular jiu-jitsu tournament” you are not training with the same intensity that makes the art so effective. Jiu-jitsu is a self-defense art and there has to be more influence on chasing the finish at all cost. So one day just as we look at karate and laugh, our art, jiu-jitsu, will be just the same. Then someone will create another art that is similar to ours but more powerful and superior. Sambo for example is already considered to be better. Look at the UFC lightweight champ Khabib. He is doing something very similar to BJJ, and it’s a submission-based art on the ground. We need to bring back real jiu-jitsu, hard nose, and tough unbreakable minds.